Citizen science projects are based on volunteer participation of untrained citizens who contribute information, data and samples to scientific studies. Herein we provide an overview of marine litter studies that have been supported by citizen scientists (n = 40) and compare these studies with selected studies conducted by professional scientists (n = 40). Citizen science studies have mainly focused on the distribution and composition of marine litter in the intertidal zone. Studies extended over regional, national and international scales, with time periods generally extending from less than one year to two years. Professional studies have also examined the distribution and composition of marine litter, but from intertidal, subtidal and pelagic zones, with some focusing exclusively on microplastics. These studies have been conducted over local, regional and international scales, usually for less than one year each. Both citizen science and professional studies on marine litter have been conducted mainly in the northern hemisphere, revealing a lack of information available on coastal regions of the southern hemisphere. A main concern of citizen science studies is the reliability of the collected information, which is why many studies include steps to ensure data quality, such as preparation of clear protocols, training of volunteers, in situ supervision by professional scientists, and revision of samples and data. The results of this comparative review confirm that citizen science can be a useful approach to increase the available information on marine litter sources, distribution and ecological impacts. Future studies should strive to incorporate additional citizen scientists who frequent marine environments, for instance, divers and sailors, to improve our understanding of marine litter dynamics. Large quantities of anthropogenic litter reach the marine environment, where they spread throughout all oceans and persist for many years (Derraik 2002; Barnes et al. 2009; Ryan et al. 2009; Eriksen et al. 2014). The accumulation of litter causes diverse impacts on marine biota, such as entanglement (Laist 1997; Moore et al. 2009), ingestion (e.g. van Franeker et al. 2011; Carson 2013; Cole et al. 2013), and dispersal of alien species (Barnes 2002; Masó et al. 2003; Kiessling et al. 2015). The extensive spreading of marine litter, even to the most remote regions of the world’s oceans, makes litter distribution and abundance surveys difficult and time consuming (Ryan et al. 2009; Eriksen et al. 2014). Coastal regions, where a large fraction of marine litter is deposited, receive visits from a wide range of people, including, but not limited to, tourists, fishermen, and schoolchildren. Such coastal users have been recruited to support scientific beach surveys to quantify marine litter worldwide (e.g. Ogata et al. 2009; Ribic et al. 2010). These volunteers (here termed “citizen scientists”) (Bonney et al. 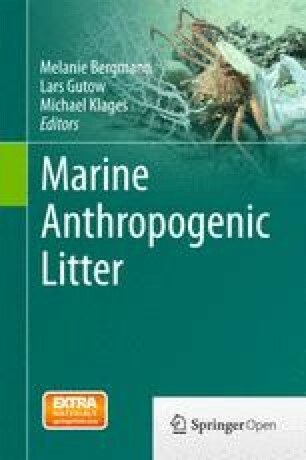 2009) have participated in the collection, analysis and interpretation of data in a wide range of studies, determining litter distribution and abundance in the marine environment (Lindborg et al. 2012; Smith and Edgar 2014; Thiel et al. 2014). Herein we provide a review of marine litter studies that have been supported by citizen scientists in order to evaluate their contribution to current knowledge on marine litter distribution, abundance, and interaction with marine biota. In particular, we compare the type and quality of data collected in these citizen science studies with those collected by professional scientists (scientists that have received a formal scientific education). Based on the results of this comparison, we offer recommendations for future marine litter surveys that are supported by citizen scientists. People from a wide range of educational backgrounds have supported scientific studies on marine litter. Their interest to participate in this kind of investigation may vary depending on their own personal motivation, which may include being part of an environmental organization (e.g. 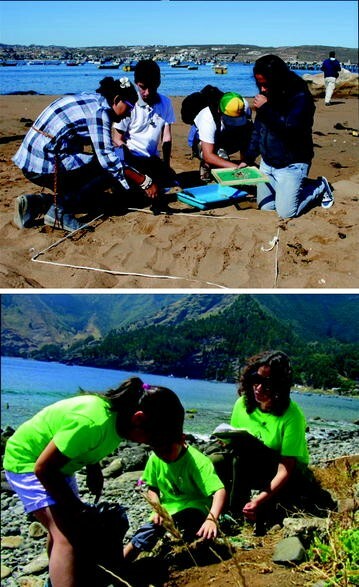 marine conservation NGO, girl & boy scouts) or an educational project within a school (Fig. 16.1). For example, beach cleanup campaigns are conducted in many countries, and can be a source of marine litter information supported by citizen scientists (e.g. Ribic 1998; Martin 2013). For this review, marine litter studies were identified by searching the ISI Web of Knowledge and Google Scholar databases for papers using the keywords “citizen science” or “volunteer” with “marine litter”, “marine debris” or “plastic debris”. We thoroughly scanned the literature, identifying all studies in which volunteers had participated in sampling and/or sample processing. We only selected studies with a main focus on marine litter; studies which coincidentally also report interactions of litter with marine biota were not considered, unless these explicitly focused on litter aspects, such as plastic ingestion and entanglement by seabirds and marine mammals (Moore et al. 2009; van Franeker et al. 2011). At the time of writing, 40 marine litter studies were identified, which were based entirely or partly on data or samples contributed by citizen scientists (Appendix 1). We also selected 40 peer-reviewed articles that were exclusively conducted by professional scientists, in order to compare those with and evaluate the importance, scope and quality of citizen-science studies. For the purpose of this review, we only included the most cited papers (according to ISI Web of Knowledge and Google Scholar databases) that have been published during the past 10 years (2004–2014). Keywords used to identify these studies were “marine litter”, “marine debris”, “plastic debris” and “beach survey”. Review articles were not considered for this comparison between citizen science and professional studies (see Appendix 1 for the complete list of selected studies). Research on marine litter has focused on six major topics: (1) Distribution and composition of marine litter, (2) interaction with marine biota, (3) toxic effects, (4) horizontal and vertical transport, (5) social aspects and (6) degradation of marine plastic litter. The majority of citizen science studies (68 %) examined the spatial distribution and composition of marine litter (Table 16.1). In these cases, citizens participated in beach cleanup activities or beach surveys of marine litter (e.g. Gregory 1991; Storrier et al. 2007), plastic beverage containers (Józwiak 2005) and small plastic debris (Hidalgo-Ruz and Thiel 2013). Apart from one study conducted by divers in subtidal environments (Smith and Edgar 2014), the intertidal zone was the only sampling zone. One citizen-science study also covered the open ocean via a drifter experiment to investigate the pathways of litter from island areas in Hawaii; citizen scientists reported drifters that had stranded on local shores (Carson et al. 2013). In most cases, data were registered on datasheets provided by an organization, but one study also created a smartphone application, which was used by personal phones and iPods (Martin 2013). Interaction of marine litter with biota was the second most common topic addressed by citizen science studies, but given the overwhelming proportion of studies on the distribution and composition of litter (68 %), this topic represented only 18 % of all studies (Table 16.1). These studies focused on specific animal groups, mostly vertebrates: seabirds (van Franeker et al. 2011; Lindborg et al. 2012), marine mammals (Moore et al. 2009), fish (Carson 2013) and sea turtles (Bjorndal et al. 1994). For example, citizen scientists supported cleanups of derelict crab traps and quantified the species entangled by ghost fishing activity (Anderson and Alford 2014), or information on species affected by marine litter was documented on an interactive website (Hong et al. 2013). Other aspects of marine litter were examined in 15 % of all citizen science studies (Table 16.1). Persistent organic pollutants were determined in beached plastic pellets, which were collected by citizens (Ogata et al. 2009; Hirai et al. 2011; Heskett et al. 2012). Transport of marine litter was studied to determine the factors driving marine debris deposition on Hawaiian beaches (Morishige et al. 2007; Carson et al. 2013). A social study examined the behavior, education and preference of the general public to reduce littering on beaches (Eastman et al. 2013). Degradation of marine litter was not addressed by citizen scientists. A large portion of professional studies was also based on the distribution and composition of marine litter (45 % of all studies) (Table 16.1). These studies examined beach litter from the intertidal zone (n = 11) (e.g. McDermid and McMullen 2004; Claessens et al. 2011), seafloor debris from the subtidal zone (n = 4) (e.g. Katsanevakis and Katsarou 2004), and pelagic plastic litter from the open ocean (n = 6) (Lattin et al. 2004; Pichel et al. 2007). In contrast to citizen science studies, a considerable number of the professional studies focused exclusively on microplastics (n = 11) (e.g. Thompson et al. 2004; Ng and Obbard 2006; Browne et al. 2010). This difference is likely due to the advanced techniques required for proper identification of microplastics (especially the smaller fraction of microplastics, 1 μm–1 mm; Löder and Gerdts 2015), which is unfeasible in citizen science studies (Hidalgo-Ruz and Thiel 2013). The interaction of marine litter with biota was addressed by a high proportion of studies (35 % of all studies) (Table 16.1). These studies focused mainly on plastic ingestion by both invertebrates and vertebrates (e.g. Graham and Thompson 2009; Boerger et al. 2010), but also on entanglement of pinnipeds in marine litter (Page et al. 2004; Boren et al. 2006), and on the impact of lost fishing gear on coral reefs (Chiappone et al. 2005). Toxic effects, transport, social aspects and degradation of marine litter were examined by 20 % of the professional studies (Table 16.1). These focused on the quantification of persistent organic pollutants (POP’s) in plastics (Rios et al. 2007, 2010; Teuten et al. 2007), the temporal variability and dynamics of marine debris at the sea surface (e.g. Martinez et al. 2009; Law et al. 2010), the socio-economic characteristics of beach users and littering (Santos et al. 2005), and the relationship between composition, surface texture, and degradation of plastics (Corcoran et al. 2009). Considering that marine litter is a global issue, the collection of data over extensive spatial scales is particularly important (Galgani et al. 2015). Professional research can address this issue, but requires a work-intensive sampling effort or the use of expensive equipment, such as buoys, aircraft, submersible vehicles and satellites (e.g. Pichel et al. 2007; Maximenko et al. 2012). These types of sophisticated surveys might be too expensive for citizen science projects, but with a reasonable budget, citizen science offers the opportunity to establish extensive networks of sampling stations on the ground. Citizen science studies have been conducted on the local (one sampling site), regional (several sampling sites), national and even international scale (Table 16.2). The more extensive citizen science studies were conducted by “The International Pellet Watch” project (see Ogata et al. 2009; Hirai et al. 2011; Heskett et al. 2012), in which volunteers from 17 countries have collected pellets from local beaches and sent them to Tokyo for laboratory analyses. This project has monitored the pollution status of persistent organic pollutants in the oceans since 2005, extending their sampling locations to several new places (Fig. 16.2). In contrast, professional studies have been conducted relatively homogeneously over all spatial scales, with the exception of national surveys, which only represented two (5 %) of all professional studies (Table 16.2). Examples of local studies include Corcoran et al. (2009) on plastic degradation on Kauai, Hawaii, Graham and Thompson (2009) on the ingestion of plastics by sea cucumbers, and Santos et al. (2005) on the relationship between beach users and litter generation at Cassino Beach, Rio Grande City, Brazil. Regional research examples are from Costa et al. (2010) on the distribution and composition of debris on beaches from Northeast Brazil, and Chiappone et al. (2005) on the impact of lost fishing gear on coral reefs in Florida, USA. A worldwide coverage was achieved by Browne et al. (2011) who determined the microplastics abundance (mainly from cloth fibres) at shorelines of 18 countries. Citizen-science studies require a lot of organization. Accordingly, short-term studies are expected to be the most common among all citizen-science studies. Nevertheless, the time range of citizen-science studies vary from single events, up to a study of 27 years by van Franeker et al. (2011), who determined the abundance of ingested plastics by northern fulmars Fulmarus glacialis from the North Sea, as an indication of litter contamination. The majority of citizen-science studies (63 %) cover time periods ranging from less than 1–2 years, followed by studies between 5 and 10 years (20 %) (Table 16.3). Professional studies varied between single events up to a study on microplastics that compared recent samples with samples taken 40 years ago (Thompson et al. 2004). Interestingly, many professional studies were conducted only once, i.e. they spanned less than one year (53 %), whereas others ranged from 1 to 2 years (10 %) and 2 to 5 years (10 %), respectively. Three professional observational studies did not report the temporal scale of the investigation (Corcoran et al. 2009; Costa et al. 2010; Claessens et al. 2011) (Table 16.3). The problem of marine litter is widespread and has caused concern worldwide. However, global knowledge about marine litter is limited, because the majority of both citizen-science and professional studies on marine litter have been conducted in the northern hemisphere. Most citizen-science studies have been reported from Asia and South America (Fig. 16.3a). Professional studies have been conducted mainly in Europe and the North Pacific Ocean (Hawaii and the North Pacific gyre) (Fig. 16.3b). This reveals a lack of information on coastal regions of the southern hemisphere, such as Africa and South America, except Chile. However, in the near future, the combination of citizen-science and professional studies can be the key to achieving global knowledge about litter sources and quantities, especially for regions of the world where this information is still needed. Therefore, citizen science studies could be a good approach to help filling the last missing gaps on the world map. A main concern of citizen-science studies is whether the collected data are reliable and comparable to professional studies. Four main aspects need to be considered in order to ensure or improve data quality: (1) preparation of easy and straightforward protocols, (2) training of volunteers, (3) in situ supervision by professional participation, and (4) validation of data and samples (modified from Bonney et al. 2009). Of the citizen-science studies on marine litter examined, 55 % included at least one of these steps (e.g. Rosevelt et al. 2013; Anderson and Alford 2014; Gago et al. 2014). The studies that took measures to guarantee data quality, provided standardized protocols, guidelines and datasheets (e.g. Ribic 1998; Gago et al. 2014). In order to create clear protocols, some studies needed to adjust the sampling target to be easily identified by citizen scientists. For instance, Ribic et al. (2010) found that citizen scientists occasionally missed small pieces of debris (no specific size range was mentioned) in a monitoring program for beach litter. As a consequence of that observation, Hidalgo-Ruz and Thiel (2013) in a study focusing exclusively on small-plastic debris, decided to sample only items larger than 1 mm, which can be identified by the naked eye after sieving of sand. Once the sampling target is determined, the marine litter items likely to be found by citizen scientists can be photographed and included in preparatory materials. Photographs of marine litter items were used in 15 % of the studies (e.g. Moore et al. 2009; Anderson and Alford 2014). Data quality can also be improved by volunteer training (e.g. Storrier and McGlashan 2006; Smith et al. 2014). Indeed, 38 % of the citizen science studies examined here included a degree of training or preparation of the volunteers. Training could consist of a one-hour classroom preparation (e.g. Smith et al. 2014) or a brief introduction in the field just before the sampling activity (e.g. Moore et al. 2009). For instance, a study on ghost fishing by derelict crab traps (Anderson and Alford 2014) was preceded by a training period. Furthermore, during one study year, participants were asked to take photos of every trap and to identify the organisms in the traps. These photos were later examined by professional scientists who confirmed that the data recorded for each trap were accurate. Scientists and survey monitors participated in the sampling activity in 43 % of the examined citizen-science studies. These professionals were in charge of assuring accuracy of debris classification, data recording and identification of missed/overlooked debris items (e.g. Ribic et al. 2011, 2012a). For example, in a study from South Korea on the impacts of marine debris on wildlife, experts from wildlife, nature and marine research institutes provided data quality assurance on a voluntary basis contributing pictures of dissections or autoradiography in order to demonstrate how animals were affected by the debris (Hong et al. 2013). Citizen-science studies can also incorporate a validation process in which the data gathered by volunteers are compared to data obtained by professional scientists. This comparative approach was applied by 18 % of the studies, which evaluated the quality of the citizen-science data by re-counting the litter items, also using a microscope to differentiate between biological and synthetic litter (Rosevelt et al. 2013). For instance, Hidalgo-Ruz and Thiel (2013) recounted small plastic particles in samples that had been counted by citizen scientists. In one case, it was found that glass shards had been misidentified as small plastic debris. Elimination of samples with this kind of obvious error from the analysis can substantially improve data quality. According to Lindborg et al. (2012), citizen scientists can dissect and analyze seabird boluses with high accuracy resulting in measurements of contamination rates similar to those obtained by professional scientists. Validation can also be done by scientists analyzing photographs of samples taken by volunteers (Moore et al. 2009). Technological equipment can be used to generate complementary data. For instance, Seino et al. (2009) used high-frequency ocean radar, airplanes and balloons to take photographs of marine litter, which were used to complement data collected by volunteers. Data quality control can also entail the elimination of erroneous data. For instance, in a user survey on beach littering, Eastman et al. (2013) explicitly reported the data that were dismissed for further analyses. These data were related to mistaken, non-sensical and incomplete surveys, such as when children were too young to accurately complete the survey, or data were from locations with characteristics that differed from the main surveyed area (Eastman et al. 2013). A remaining 45 % of citizen-science studies had no data quality control. In certain studies, no specific validation step might be necessary because volunteers only gathered qualitative data during beach cleanup activities (n = 11) or citizens only participated in opportunistic sighting and sample collection of dead animals, bird boluses, pellets and drifter buoys found on beaches (n = 5). No data quality control was explicitly mentioned in the professional studies examined herein. In order to carefully plan a citizen-science study, certain models for developing studies should be followed (Bonney et al. 2009). The research question should be easy to understand by participants and should incorporate strategies to motivate volunteers (Eastman et al. 2014). High levels of personal motivation, training procedures, and encouraging volunteers to describe any uncertainties to researchers resulted in improved accuracy achieved by citizen scientists (Lindborg et al. 2012). The time commitment of the participation of individuals and organizations should be respected. Accordingly, project leaders should concede ample time for the recruitment and training of volunteers. Sampling methods and data collection should be easy to manage with simple tools (e.g. transects, quadrats). Technology, such as smartphone applications and geo-referenced photos can be a novel tool to explore (e.g. Martin 2013). It is strongly recommended that a professional scientist demonstrates the tasks that citizen scientists will be performing in the field beforehand. Whenever possible, scientific surveys themselves should be supervised by scientists in order to ensure proper sampling and data collection. Participants should also be involved in the data evaluation and communication of results as a concluding activity, because this will enhance their commitment to the activity. Considering these recommendations, citizen scientists are capable to collect relevant data, even showing no significant difference with results gathered by experienced scientists (Thiel et al. 2014). The vast distribution of marine litter throughout the world requires extensive sampling efforts of research teams, and the available information is still limited to certain topics of research and regions of the world. In this respect, citizen-science projects have made important contributions to marine litter science. Collaborations with citizen scientists can be a useful approach to expand the understanding of marine litter in the world. Most studies have focused on the distribution and composition of marine litter, and beach cleanups are activities with the most active participation from citizen scientists. Citizen science studies can cover a wide range of scales, from local to international range, single events to long-term multi-year projects. Through the use of citizen scientists, new research areas can be addressed in the future. Coastal marine litter may be monitored by citizen-science studies, which can also include other citizens related to the sea, such as local people, fishers, sport clubs and tourists. For instance, diver associations around the world can be trained to sample subtidal plastic debris, and new projects can be initiated with the help of sailing clubs, where long-distance travelers can survey floating marine debris by direct observation at sea, to study the distribution, composition and degradation of marine litter in the open ocean. Citizen scientists can help to determine local litter sources, thereby contributing to keeping coastal regions clean. Citizen-science projects can focus on interviewing mariners, coastal people and local governments, for the purpose of identifying ways to reduce marine litter deposition. With proper coordination, citizen science can include several other topics, such as interaction with biota and toxic effects. Nevertheless, a main concern of marine citizen science is to assure the quality of the collected data. In general, studies should include several steps to ensure data quality, including clear protocols, training of volunteers, participation of professional scientists, and revision of samples and data. If these considerations are taken into account, citizen scientists not only can help with investigating the problem of marine litter, but they can become key allies in solving the problem of marine litter. It seems ironic that most professional scientists studying marine litter have initially been trained in marine biology, microbiology, oceanography or related disciplines. By having redirected their research attention to the problem of marine litter, they have demonstrated that they are true citizens of the oceans! With their fascination for the sea, they join the thousands of enthusiastic citizens all over the world who have contributed to some of the research discussed herein. We thank all the schoolchildren and teachers who have participated in the citizen science program “Científicos de la Basura” and who continue to motivate us every day in this quest for a clean ocean. We are also grateful to two anonymous reviewers and to Annie Mejaes who did the final language check of the manuscript.